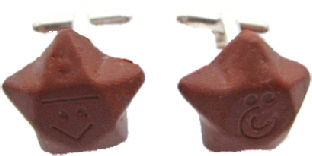 Quirky face handmade polymer clay chocolate star silver plated cufflinks. Due to the handmade nature of these products, styles and sizes may vary slightly to picture. * Not suitable for kids and not real food.